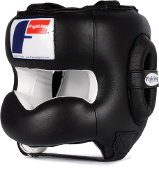 Perfect for athletes that want to spar without the face contact! Fully molded plastic face bar is surrounded with a trio of sponge foam, and high and low density foams for a comfortable no penetration barrier. Fully padded forehead, ears and back with a full grain leather shell for an unbeatable training headgear. An adjustable chin strap, and top and back lace ties provide a custom fit for all users. A soft, smooth and durable inside liner allows athletes to wipe clean between uses. Train like the pros!